As assistant dean for Student Diversity Programs in the School of Education, Aaron Bird Bear MS’10 fills a lot of roles: recruiting and retaining students from underrepresented communities, overseeing the summer College Access Program, and serving as a consultant for American Indian Curriculum Services. He also co-leads a group that will create signs honoring the Native American presence in the campus area — ones that will present messages in both English and Ho-Chunk. The Associated Students of Madison [ASM] passed a resolution in September 2016 and asked for two things. They asked for a plaque next to Abraham Lincoln, interrogating Lincoln’s role in the Indian wars of the western Great Lakes and the subsequent hanging of 38 men, the largest mass execution in U.S. history. And then they wanted some explanation of how land grants intersect with native land cessions and the entirety of public education. The institution has to respond in some way, including one that might address [those] concerns. But there’s a lot of interest in pulling back beyond the colonial years of the United States and looking at the full 12,000 years of depth of humanity here. We’re still working on the first sign. It’s a lot harder than we ever imagined. There’s a lot of trauma, grief, and frustration from the side of the First Nations here in the western Great Lakes. … These signs have to acknowledge that. There’s a process to whatever we share. We started as a bureaucratic process [last] summer, hammering out learning goals, getting some initial ideas … And when it came to our first draft, the Ho-Chunk members on our committee said, “Just giving us your ideas to translate is not collaboration.” … That made us really stop and reflect. We realized that we needed to get to a place of sharing that would more mirror how they would run this process. You’re from a Native background. Does that build your credibility with the Ho-Chunk members of the committee? I’m Mandan Hidatsa, Diné Nations, and you’re either Ho-Chunk, or you’re not Ho-Chunk. It’s binary. … So I’m in the same boat as a lot of European Americans. Not from here is the category. Where will these signs be located? One is in direct response to ASM — by the Lincoln statue. Another is proposed at the Observatory Hill overlook, because it allows for a big-picture understanding of the depth of humanity that lived here. It’s next to the Washburn Observatory. And then another sign by the Observatory Hill effigy mound group, a sign by the Willow Drive effigy mound group, and then the last sign would potentially be next to Social Sciences. That’s where we [currently] have the Blackhawk marker from the Class of 1888, which talks about the ethnic-cleansing policy called the Indian Removal Act and how it affected the western Great Lakes. But the Blackhawk marker is talking about people from Rock Island, Illinois. Retreated and pursued are the two verbs on the sign. … It would be wonderful if the Class of 1888 had written, instead, that the Ho-Chunk persisted in establishing resistance. The Ho-Chunk are still here. The sign would look very different. Its verbs would be resisted and remained . It’s a more complicated story. Too often, we’re tempted to experience much of our world through the lens of a cell phone camera. But each April, the On Wisconsin Annual Spring Powwow creates a swirl of feathers, beads, and colors that moves too quickly to capture on screen. At last year’s event in the Field House, spectators rose as participants took to the floor for the Grand Entry, and a Ho-Chunk elder offered blessings in the tribe’s traditional language. A drum circle played the “Veterans Honor Song,” and veterans entered carrying tribal banners, POW-MIA flags, and the American flag. The procession continued until all participants — organizers, pageant royalty, and jubilant community members — were dancing in a circle. For nearly four decades, the scene has looked effortless. But members of the planning committee, UW-Madison’s Wunk Sheek student organization, know it’s just the opposite. Wunk Sheek was founded in 1968 with a simple goal. “We’re trying to bridge the gap between the UW campus community and the eleven tribal nations living in Wisconsin,” says Samantha Pecore x’16, the group’s vice president. The small population of Natives on campus sparks a need to educate the majority on American Indian culture. Wunk Sheek does so in part by organizing Native November, featuring numerous campus events to celebrate American Indian Heritage Month, and holding the spring powwow. The powwows are free and open to the general public as well as members of the Native and campus communities. They provide opportunities for all to actively participate during inter-tribal songs in which everyone is encouraged to dance. 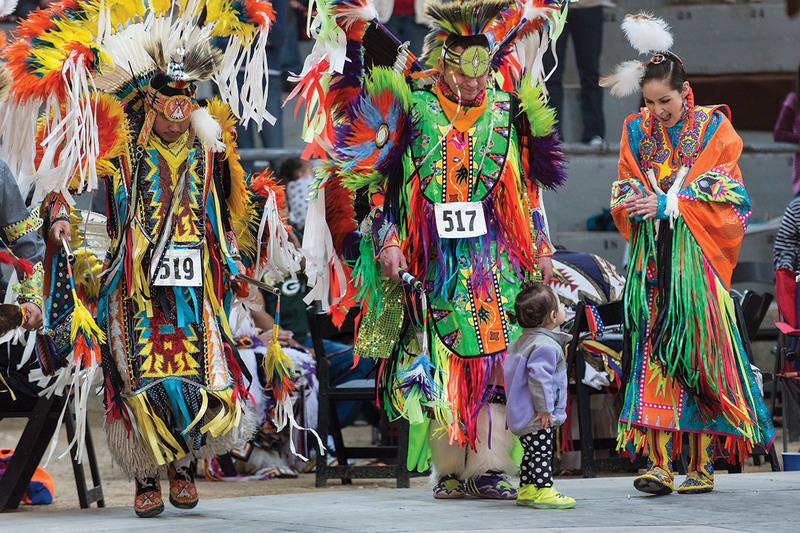 Last year’s event drew more than 2,800 attendees, and many of the dancers, singers, and drummers were from the Ho-Chunk tribe, which historically occupied the Madison region. “We always honor Ho-Chunk because we’re on their land,” explained Pecore at last spring’s wrap-up meeting. They also honored Oneida, a tribe whose ten-thousand-resident reservation is near Green Bay.